Led by Mary Nishioka, Terry and Sue Hall, and Mary's daughter Lauré had some of the best fishing of their collective lives. We fished the Green River tailwater below Flaming Gorge Reservoir at Dutch John, Utah. Interestingly, the local fly shop website ranked the fishing for the week of April 14 only six on a scale of one to ten. But we'll let you be the judge. Three days of drift boat fishing saw our group net about fifty fish each day. ALL fish over fifteen inches. We caught four types of aggressive trout: browns that loved to jump; hard fighting rainbows; pretty cutthroats; and Jurassic-type cuttbows. Most of our fishing consisted of nymphing midges or BWO imitations under indicators. The frequent opportunity to sight fish in the gin clear water was only topped by an amazing afternoon when the dry fly was king. We fished hard (if there is such a thing) with guides who expertly drifted over fish, along seams, just off foam lines all the while helping us understand and develop skills needed to adjust terminal tackle and achieve drag free drift. But this trip, like all best fishouts was about more than fish. It was about the people, the environment, and coming back feeling you knew more about the sport. And we felt very fortunate to have Mary select a fine time to fish the Green, great guides to help us fish better than we really can, and a unique place to stay where the people were kind and gracious and you hope to see again. But we digressundefinedit's always easier to be philosophical AFTER you caught the fish. Day 1Met up at Salt Lake City airport and drove to Park City for lunch and to shop post-olympic merchandise. We forgot fly fishing was not an Olympic event. So we had to resort to the local pub and a very popular beer, Polygamy Porter, advertised as: Why have just one? Bring one home for the wives! Day 2This day was as true as the sunrise. Here's the picture. 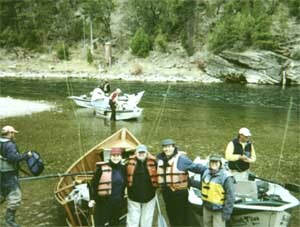 Drift boats sliding downstream amid happy smiles and shouts of people holding long rods bent to the cork. Seldom looking up to see the beautiful forested canyons because you were too busy landing some while perfecting the LDR with many more large trout hooked on size eighteen nymphs. Our two boats ended the day in grand styleundefineda double! Day 3Jurassic winds challenged the notion of a proper dead drift presentation. Under these conditions we chose to fish eddies along the large pools where trout lined up to fish actively. Our group caught about the same number of fish as the day before, but we had to work for them. But when you see big fish, how can you stop? Back at the ranch, the high winds put off the evening trail ride. So the ranch owner took Sue and Lauré far up into the hills to see new foals and fifteen wild mares. Day 4Snow on the ground. Fishmaster Mary proclaimed the conditions were perfect. She even pulled out the Dec '99 "Fly Fisherman" magazine article on the Green River to prove it. So off we went, after an extra large ranch house breakfast, just in case. As we started down river, so started the snow. We kept fishing and the fish kept jumping into the net perhaps aided by the river otter perched high on the bank. Finally stopped for lunch to put on the foul weather gear we should have had on all morning. Now we were ready for the elements. You guessed it. Once back on the water the sun broke through. We got warm and the fishing got hot. Blanket hatch of BWO, size eighteen. It took the guide's dry wit to settle us all down by inquiring whether a trout?s ears ring when it slams its mouth shut and there is no fly. A truly special part of this trip was staying on the eighty-four square mile Spring Creek working ranch in Minnie's Gap, WY. Don't ask me how Mary found it, but she found a gem. Home style dinners were optional, but after just one ranch house breakfast we were hooked (so to speak). We enjoyed sitting out in the evening watching horses galloping down the trail, being always welcome for early morning coffee, and daily sightings of elk, deer, and pronghorn following familiar paths across the broad landscape. Day 5Oh yeah, on the way back home, Mary felt some of us needed a little culture. First stop Dinosaur National Museum in Vernal, UT and then twenty miles down the road Dinosaur Quarry at Dinosaur National Monument in Jensen, UT. Both were fascinating and well worth the stop. They say life began in the water and then moved onto land. Could there be dinosaur size trout in the Green River? Either way it's an amazing fishery. At the put-in of the A section. Good guides can really make the trip.....especially when have come a long way. 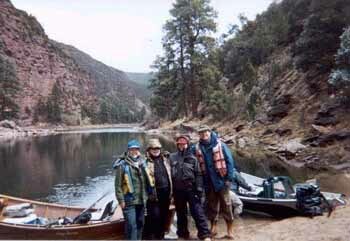 We had two such guides on the Green River in Doug Burton and Darren Bowcutt. Both guides standout for their willingness to really do the work necessary to insure your success, flexibility to optimize fishing, and instructive awareness to subtle changes in fishing conditions. 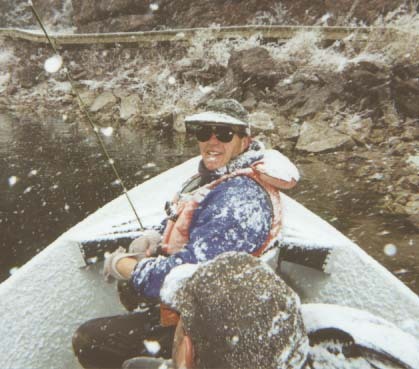 Doug has fished the Green River for fifteen-plus years and is considered to be the dean of river guides. He has an awesome custom-made wood boat made from exotic African hardwoods to prove it. His overall knowledge is matched by a willingness to try different approaches (read innovative) to insure you get into fish. Darren is the next generation. Eager to demonstrate and impart fishing skills while observant of your catch rate versus other boats. His knowledge of what works on this river and a naturally competitive nature have established him as of the best. If you would like additional information Mary Nishioka can help or you can contact the guides thru Trout Creek Flies in Dutch John, Utah: email: dbreer@union-tel.com; telephone: 1-435-885-3355 or 1-800-835-4551. Spring Creek Ranch in Minnies Gap, WY about 10 miles from Dutch John, Utah is a great place to stay. The rooms are clean and have a view of the eighty-four square mile working ranch. The ranch made our trip to the Green River truly special. Full ranch breakfast of eggs, pancakes, breakfast meats, and fresh biscuits is included. They also serve dinner for a reasonable cost. The owners are warm, eager to please and have great stories. Contact Wayne at 307-350-3005. Troutsource This one has a list of books and a chat room about the Green River.